Positive self-belief is an internal aspect of everybody's psychological make-up. When you are looking at achieving success and reaching your goals remaining positive is important. That self-belief must come from within. You see it at Spurs when the players speak, it is all positive, rarely do you hear anything negative. Those that do make negative noises are swiftly removed out of the way. Negativity does not breed success so why have it around? You have to ask yourself why some fans are so negative, believing they, with all their experience of top level sport and experience of running major companies, know better. take an injury, you can look at that as a negative or you can look at it as an opportunity for someone else. Against Fiorentina, the third best team in Italy right now, we were without Harry Kane, Jan Vertonghen and Mousa Dembele, the spine of the side. Did it make a difference, no. If their replacements didn't feel valued do you think they would have performed at the levels they did? The practice of positive self-belief is about asking questions, questions that relate to what you can achieve (goals) and how you will go about achieving these goals. You have to make it a habit to question your belief. If you limit your thinking, you limit your achievement. If Mauricio Pochettino limited his thinking to only finishing fourth we wouldn't be where we are in the table now, it is because he challenged belief and set a target of first that we are where we are. As a coach I can assure you he will have set himself that target and he is quietly working to achieve his personal goal. That goal ties in with the clubs ambition and he has built ambition within the players. If they achieve he is achieving. You can take control of your inner-self and focus on what your mind is informing you or drift along shouting you know what needs to be done but never doing it. The positive self-belief process is started during training. During competition you develop the positive self-belief process. It doesn't come overnight, as with any skill it needs to be practised and you'll make mistakes before you hone it. You'll need to be patient as positive self-belief is not a natural process, which explains why many fans don't have it. It takes time, but the more you practice the easier it becomes. What it is you want to achieve has to be realistic, but it is up to you to determine what is realistic and what is not. I had someone email me earlier in the year saying we wouldn't be able to keep hold of our players so there was no point building a young side to grow together, they wouldn't stay together. Do you believe that? I didn't then, as grow increases desire, as the side grows, as the club grows so does the desire to be a part of it. They hadn't taken account of progress, they were limited in their thinking. If Daniel Levy and Mauricio Pochettino were limited in their thinking we'd still be in enviously looking up, instead of looking down. If a manager can't achieve what you want them to achieve then don't hold on to them, find someone who can achieve and take you forward. I'm not going to knock Daniel Levy for that, far from it. Like it or not he could teach many a fan a thing or two if they had open minds are were receptive to learning. Success is achieved by those with an open mind prepared to think beyond the majority and prepared to act on that. You can get all your Sporting Gifts from the Football-Shop.net just click the link and your gift will be sent directly to the delivery address you give, ideal for your birthday presents. You can read further TOTTENHAM NEWS, VIEWS, and ARTICLES from Tottenham Hotspur Blog News, the site readers consistently comment is the best Spurs blog on the web. It is written by a Spurs fan, not a bunch of staff writers, nor with an anti-Spurs theme. Should we take the sport out of sport? For all you golfers out there, there is a range of products on offer at Football-Shop.net. 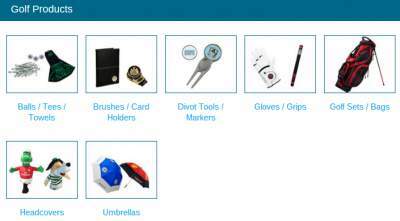 You can choose from Golf Balls, Tees, Towels, Brushes, Card Holders, Divot Tools, Markers, Gloves, Grips, Gold sets, bags, Headcovers, Umbrellas, plus, of course, wallets for buying your round after you hole in one.